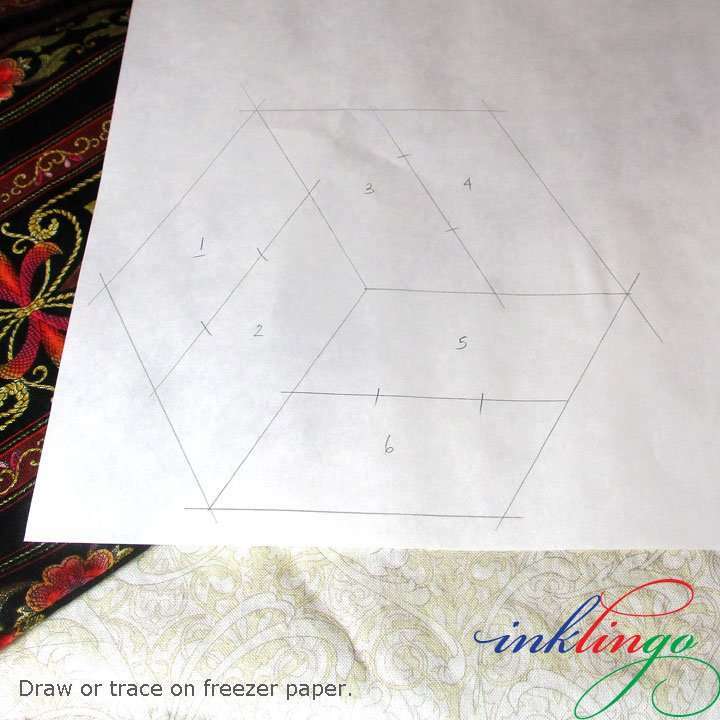 NOTE The freezer paper template method described here applies even if you never print with Inklingo. I published this short video with 300 Pieced Hexagons in 2013. 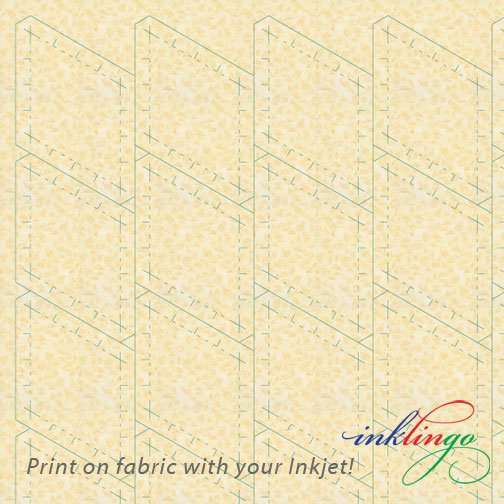 Every one of the 300+ designs can be made in several sizes by printing the shapes on fabric with Inklingo. Print on fabric—and sew by hand or by machine. 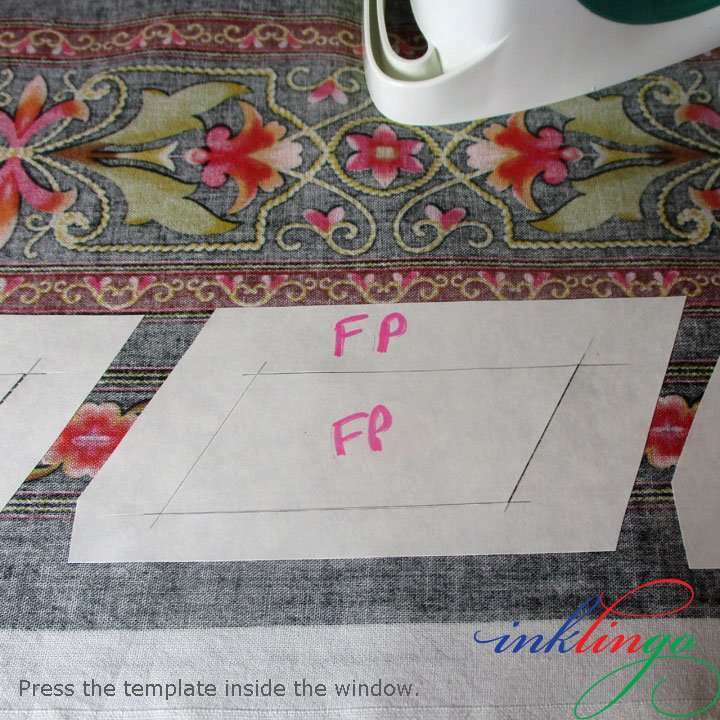 Freezer paper templates—and sew by hand or by machine. 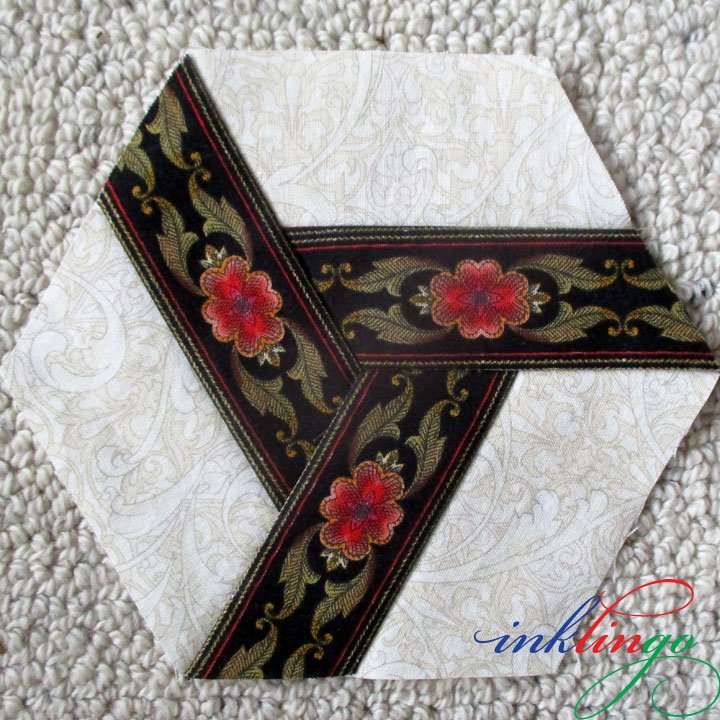 Acrylic templates—There is nothing an acrylic template can do that freezer paper doesn’t do better. Of course, you already know that printing on fabric is my first choice but what if the shapes are NOT available for your own unique design or for one you see online or in a book? This Pieced Hexagon is one of the designs in The New Hexagon by Katja Marek. All I need is freezer paper and my ordinary sewing tools (pencil, ruler for drawing, acrylic ruler for rotary cutting, mat, etc.) There is nothing to buy. Trace from the book—or start with a larger or smaller hexagon or even a different division of the hexagon. There are no limits to what you can draw inside the hexagon, as long as you can cut it apart into individual shapes. If they fit together on the paper, they will fit together when you sew them together. 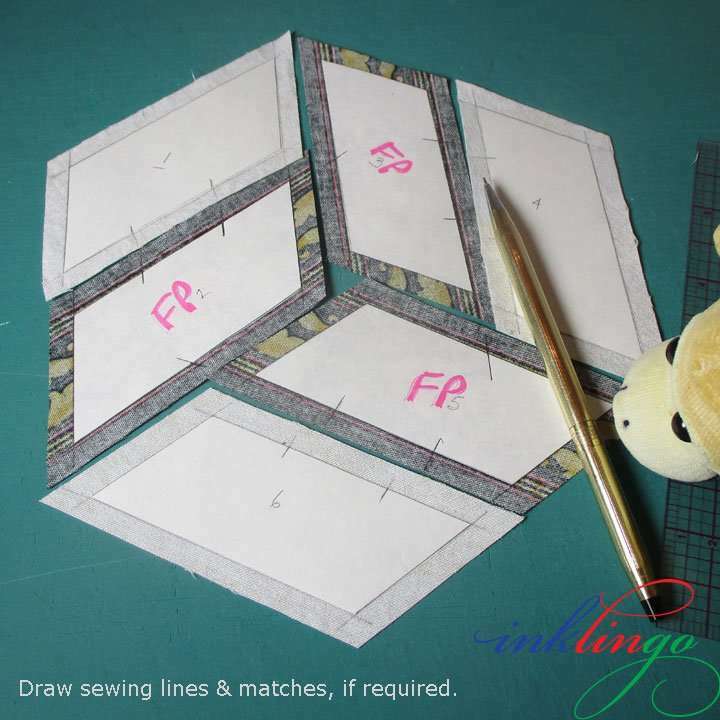 TIP Inklingo shape collections always include the shapes without seam allowances to print on freezer paper/paper and you can print anything you can draw in EQ (Electric Quilt software) too. I cut the freezer paper drawing apart, so I have FP templates in the finished size. Iron to the wrong side of fabric leaving room for seam allowances all the way around. 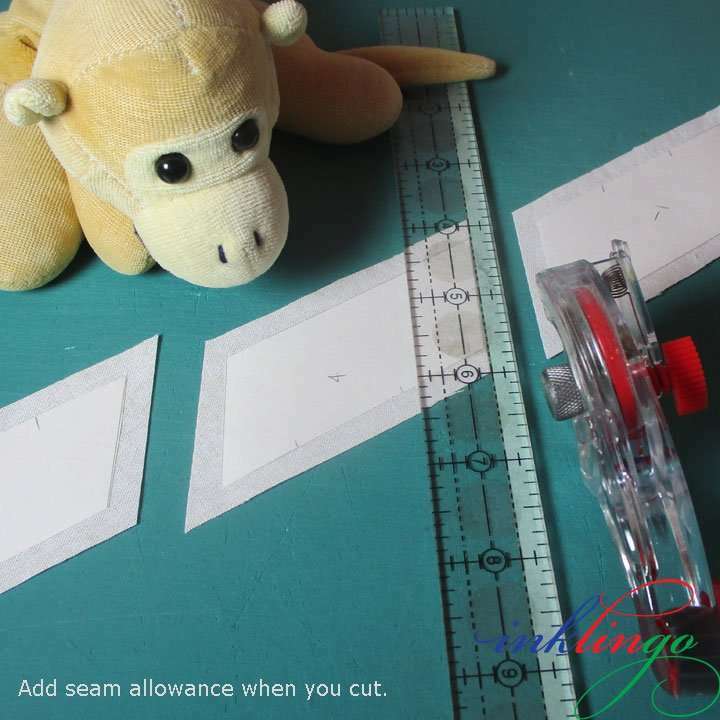 TIP I find it most efficient to work with strips of fabric cut to an appropriate width (eliminates waste and extra cuts) and use a 0.5 inch strip of paper between the shapes to allow for two perfect 0.25 inch seam allowances with one cut. TIP I position a strip of green masking tape (one or two layers) on the underside of the acrylic ruler to indicate the width of the seam allowance. You can choose wider or narrower seam allowances. Total flexibility. 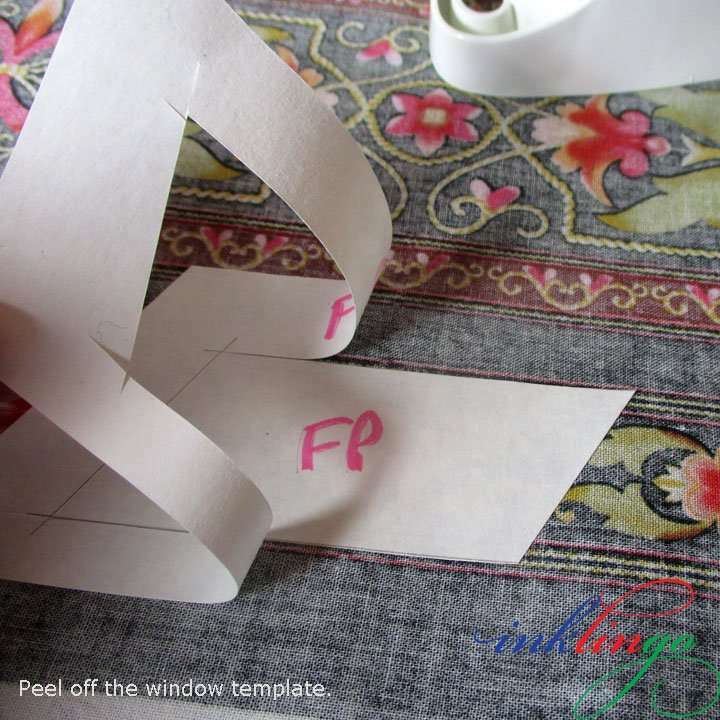 If you are fussy cutting, trace the shape again to make “window templates” and iron in position. I used 3 window templates, so I could be sure there were enough flowers and all of the designs would be identical. TIP You can iron to the right side of the fabric or the back. 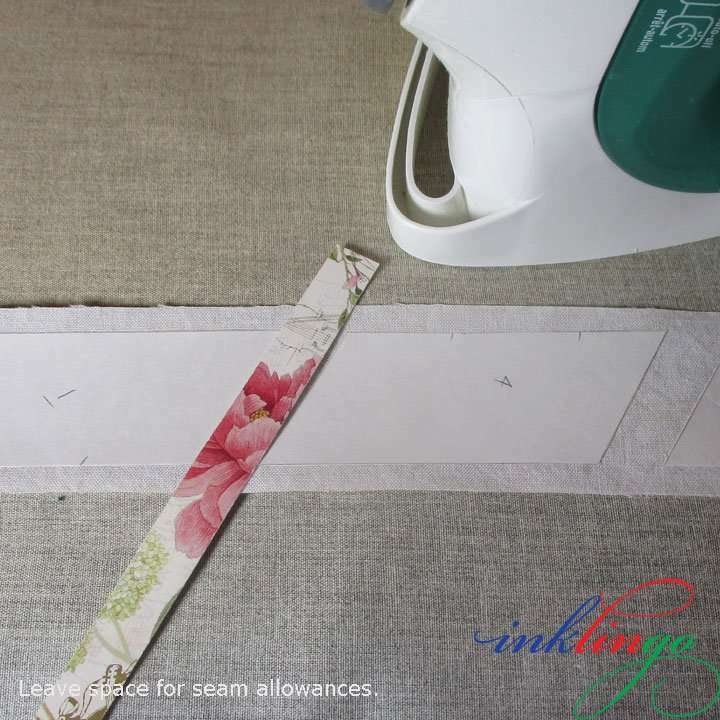 If you will be marking sewing lines, it is an advantage to work on the back of the fabric but you can work from either side. This is a Jinny Beyer border print (no affiliation). Iron the template (finished size) inside the window. TIP I wrote FP on the paper side, so I would not mistakenly touch the iron to the plastic-coated side. Peel off the window template. Now the FP template is exactly right for fussy cutting and won’t slide around before it is cut. TIP Label and store your templates in envelopes, so you can use them again—and again and again and again. 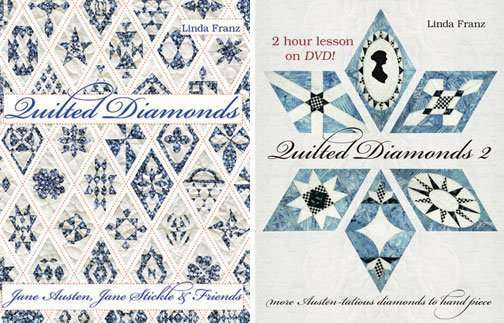 I still have all of the templates I used to make the diamonds in my Quilted Diamonds books. I stored them in “glassine” envelopes (used by stamp collectors) and they are still perfect after almost 20 years. 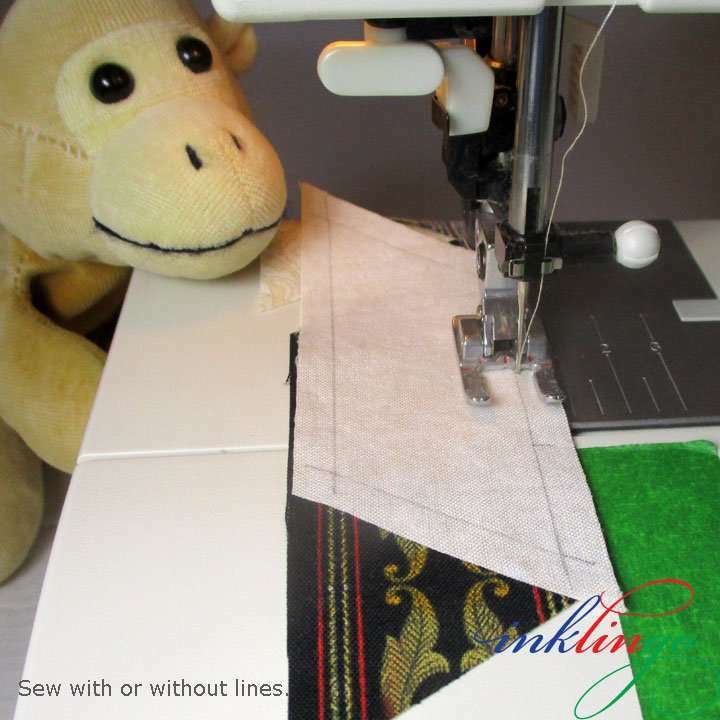 Optional: Lightly mark sewing lines on the fabric with a mechanical pencil and ruler extending the lines beyond the corners to create crosshairs to mark the seam endings. 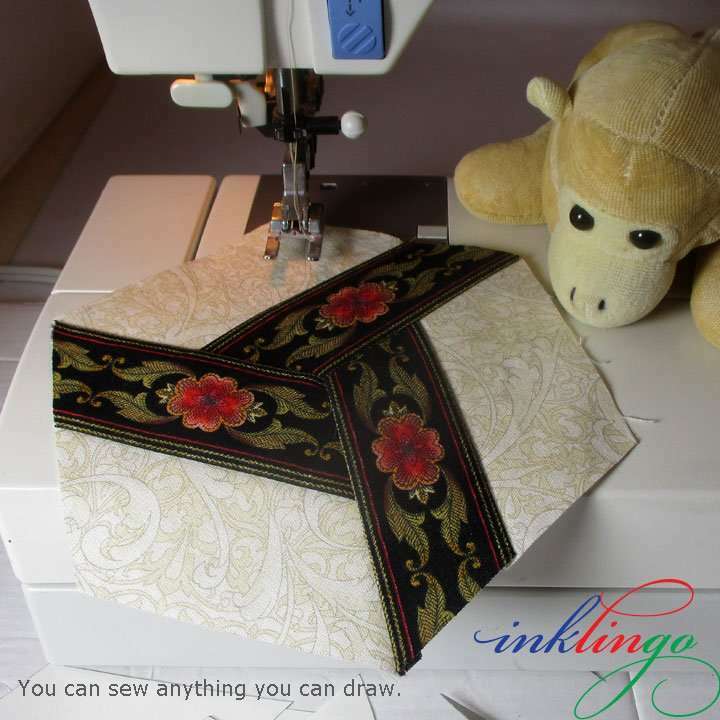 For machine piecing, the lines are not absolutely required but if you are used to sewing Inklingo shapes, you know how nice it can be to have a line to sew along! TIP I like to lay the pieces out in position (above), so I can visualize the whole block and so I know I haven’t forgotten anything. Sew by hand or by machine. TIP There are videos on the Main Hexagon Page (under the Shop tab on the website) showing how to sew from crosshair to crosshair by hand and by machine and how to press so your blocks look their best on the front. For this block, sometimes I sew edge to edge (sewing the 3 units) and sometimes I sew edge to crosshair (at the center). I pressed the seam allowances toward the dark and clockwise around the center intersection. You can sew anything you can draw—or trace—or print. There is nothing an acrylic template can do that freezer paper doesn’t do better. Always use templates WITHOUT seam allowances. Whenever a shape is not Inklingo-able (yet), I recommend freezer paper. Why I don’t sell acrylic templates. Anything you can draw–working from a picture of Dodecagon. I am thrilled with the response. It seems that many quilters would like a separate group for QD on Facebook—in addition to the Inklingo IO Group (previously on Yahoo). We’ll be able to share tips and ideas and fabric choices and LOTS of photos. I am planning to get it all set up before the end of April. “If I’ve said it once, I’ve said it 1000 times.” (Echos of my Mum): “You can sew anything you can draw on freezer paper,” so it is not mandatory to have the Quilted Diamonds books to join the fun. Of course, I think the books are beautiful and include wonderful photos and inspiration—and there is still time to order before we really get rolling. In the meantime, you are welcome to share your diamonds on the Inklingo FB Page and in the Inklingo IO Group. There are some great photos already. We started with a video and I’ll end with a video. 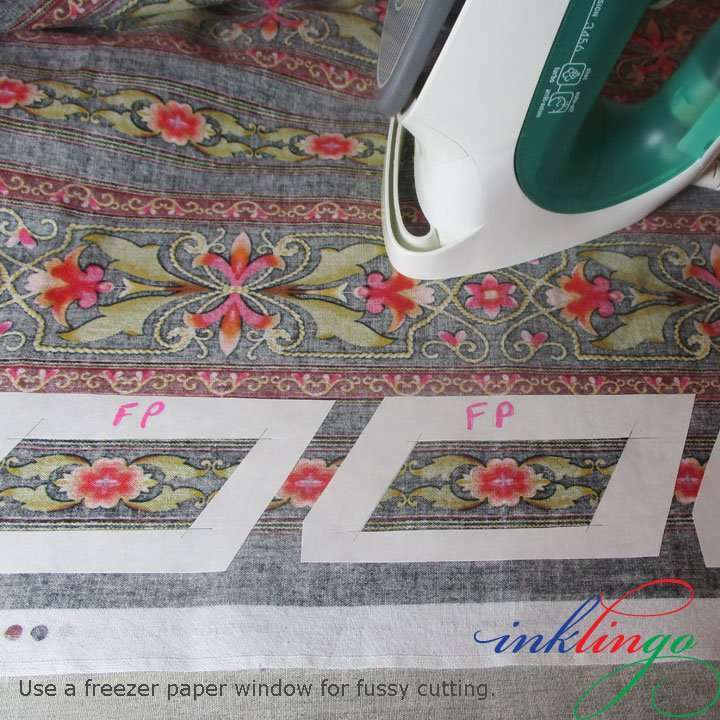 Freezer paper templates are the next best thing to printing on fabric with Inklingo. To get started with the best, please visit the Main Beginner’s Page on the website to order and download the Diamond Triangle Square shape collection. It’s free. I can hardly wait to see your diamonds—and whatever else you draw and sew! Thank you for visiting.